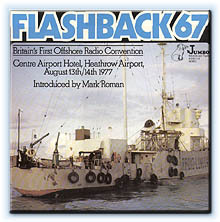 ‘Flashback’ 67’ was held at the Centre Airport Hotel, near London’s Heathrow Airport Hotel, over the weekend 13/14 August, 1977, to commemorate the tenth anniversary of the Marine & etc., Broadcasting Offences Act. Dozens of Free Radio Celebrities helped make the occasion the Free Radio Event of all time. For two days there were well-prepared presentations and talks on a number of Free Radio subject. This album captures some of the best moments from the two-day event. Mark Roman narrates the story which includes highlights from the following speakers: Ian Anderson - ‘Programme aspects of Pirate Radio’, Paul Harris - ‘Pirate and Politics, Alan West - ‘Life on Radio Nordsee’, Robbie Dale - ‘Radio Caroline’, Bill Rollins - ‘Tower Television’ - Was it a hoax?’ Tony Pine - ‘Forts, Towers and Radio Stations’, Ian Damon with Mark Roman, Duncan Johnson and Mitch - ‘Wonderful Radio London’, Mark Hurrell with Carl Kingston and Phil Mitchell – ‘The Voice of Peace Radio Ship’, Andy Archer – ‘The Offshore Radio Quiz’, plus extracts from the open discussion and extracts for the live link-up with the ‘Mi Amigo’. These are some of the last copies of pressings made at the time still available.